A severely underrated epic fantasy debut. 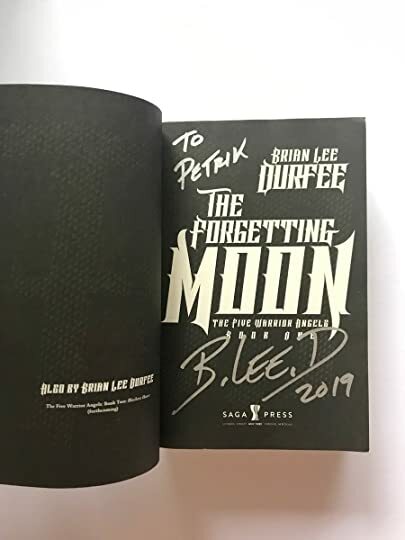 The Forgetting Moon is Brian Lee Durfee’s debut and it has been published for almost three years now. Honestly, it’s quite sinful that this book has less than 500 ratings on Goodreads at the moment; not only this is THE biggest fantasy debut I’ve ever read so far, The Forgetting Moon is also one of the strongest beginnings to an epic fantasy series I’ve come across. I’m truly flabbergasted by how underrated this debut is. Gorgeous cover art by Richard Anderson, a beautifully drawn map by Robert Lazzaretti, high-quality floppy paperback (yes, this is a plus), and most importantly, amazing content. Why is no one talking about this book!? I seriously wish someone had recommended this book to me; I never heard about this series until the author himself sent a review request to me and I’m gratified that he did. I received an advanced reading copy from the authors in exchange for an honest review. Last Bastion by Rachel Aaron and Travis Bach. It seemed, however, that Rachel Aaron and Travis Bach decided that safety will be a bit boring for the fictional characters and the readers. Hence, they gave us a heart-pounding, fast-paced, action-packed and dangerously addictive MMORPG-style adventure in the world of Forever Fantasy Online with a great cast of characters. The story picked up immediately from the ending of the first book. Our main characters, James and Tina, arrived at the city of Bastion to seek refuge and find some answers after the world of FFO was suddenly released from the Nightmare. A term used by the NPCs who are supposedly real people to describe their entrapment in the game environmen, the Nightmare is so named for the dreadful never-ending cycle ofreliving the quests the players undertake, oftentimes dying a painful death over and over again. What greeted the player characters, however, was a city on fire and laden with corpses. Not exactly their idea of a safe haven from the constant danger and fighting they’ve encountered in the past few days. The man who called himself Petrik will now review The Great Hunt, the second book in The Wheel of Time series by Robert Jordan. Everyone who’ve read the first book most likely knows what the title of this installment implies. The Great Hunt continues immediately from where the first book left off. Allow me to mention how ridiculously repetitive—and hilarious, I guess—the prologue of this book was. It starts with “The man who called himself Bors,” and within a single prologue, the exact phrase “the man who called himself Bors” was mentioned literally 34 times. The man who called himself Petrik could be wrong, but the man who called himself Petrik THINK that the man who called himself Bors, is in fact, the man who called himself Bors *gasp* *suspense* *CPR the man who called himself Petrik out of this SHOCKING revelation* The man who called himself Petrik was amazed by Jordan’s way of increasing his word counts by 170 words. Jordan could’ve just written “Bors” instead of “the man who called himself Bors” but he won’t, that 170 words is a matter of Light and Dark! The prologue became a firm reminder to the man who called himself Petrik that this will be a series—despite all the greatness—that is full of repetitive phrases; so far the man who called himself Petrik hasn’t been proven wrong. ARC provided by the publisher—Subterranean Press—in exchange for an honest review. Anthony Ryan is back with a brand new novella in a completely new world. The Light Brigade is my first sci-fi read of the year (shocking, I know) and it’s also the first time I’ve read a book by Kameron Hurley; I assure you it won’t be the last. I received a copy of the audiobook from the author in exchange for an honest review. Josh Erikson does it again with his stellar narration in Fate Lashed, and this time with a faster-paced, action-packed and riveting plotline. In the previous book, we got the origins story of Gabriel Delling – how he became intertwined with supernatural entities and ended up as a human with the ability to use magic (well, just somewhat at this stage). After losing the evil God from his head and spending time hiding out in a remote cabin to ruminate, he returned to civilization and in no time landed himself into trouble again. As fate would have it, the powerful inner circles of the Umbras are now contending to seek a ‘Key to the Universe’ which has revealed its existence just about the same time that Gabe got himself unwittingly embroiled in the affairs of these creatures from the Ether. That he survived what he did in Hero Forged, Gabe became a wildcard that fate has neither a read nor a hold on. In other words, he is now the key much sought-after player in this quest for the Key, for better or for worse. Here it is, I’m riding the winds of time! Wheeeeeeeeeee! Another massive fantasy series to finish, a new epic adventure to undertake. Like many modern fantasy readers, the last three books finished by Brandon Sanderson played a huge motivational drive in my attempt to start and finish The Wheel of Time. I honestly find this series to be even more intimidating than Malazan Book of the Fallen due to the sheer number of word counts in it. 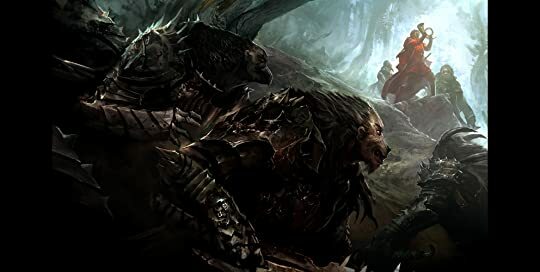 To give a bit of information on how intimidating this series is, the last two massive series I began and finished last year was The Realm of Elderlings (4.1 million words) by Robin Hobb and Malazan Book of the Fallen (3.3 million words) by Steven Erikson; the entirety of The Wheel of Time consists of 4.4 million words. That’s how gigantic this series is. If it weren’t because Sanderson is one of my top favorite authors of all time and the fact that I’ve completely run out of his adult fantasy books to read, I probably wouldn’t have started this series at all. That being said, no matter what the initial reason is, I’m really glad that I’ve taken the important first step towards conquering The Wheel of Time. ARC provided by the publisher—St. Martin’s Press—in exchange for an honest review. A Hero Born is the start to Jin Yong’s highly praised classic series but a lot of the promising quality of the book seems to get lost in translation. ARC provided by the publisher—Harper Voyager—in exchange for an honest review. The newest rising queen of fantasy is back with her newest book, The Dragon Republic, and it managed to live up to my super high expectations.